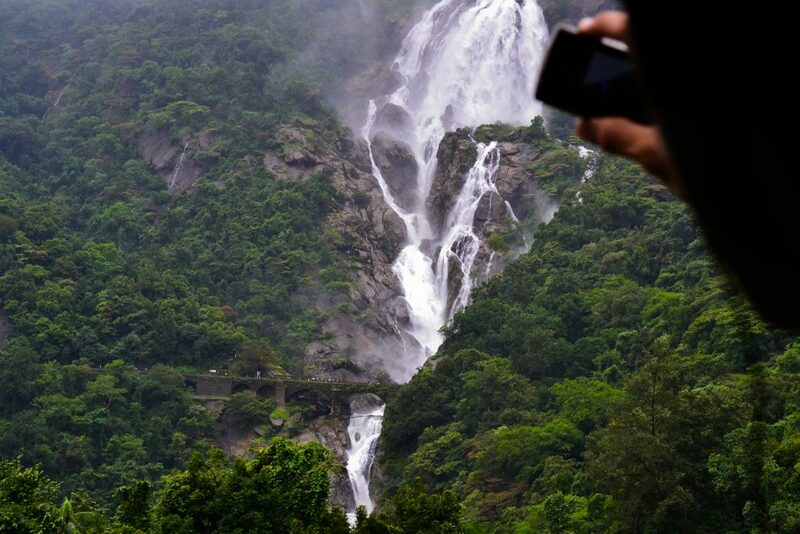 A short photo essay on the DudhSagar Falls and my experiences. Instead of reading so many blogs and trying to make sense of them, I have distilled the information into a map, as shown below. Roads in Goa are pretty well maintained up till both Kulem and Castlerock stations.
. You can choose to begin your journey from either Kulem or Castlerock stations (Roads lead to both). 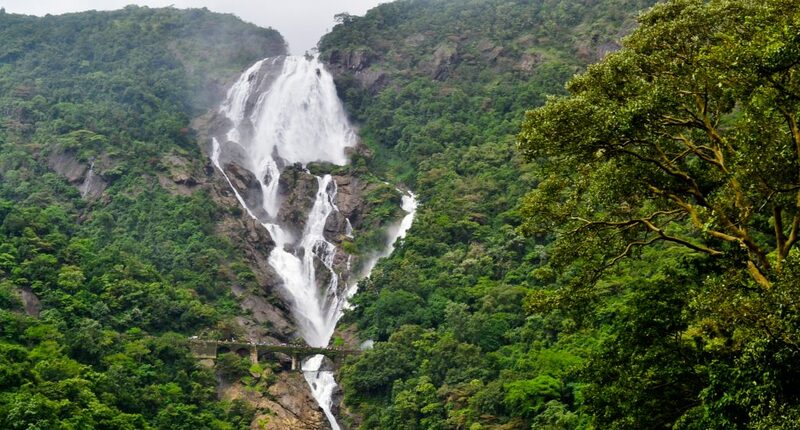 If it is not monsoon, there are jeeps available to take you to Dudhsagar. 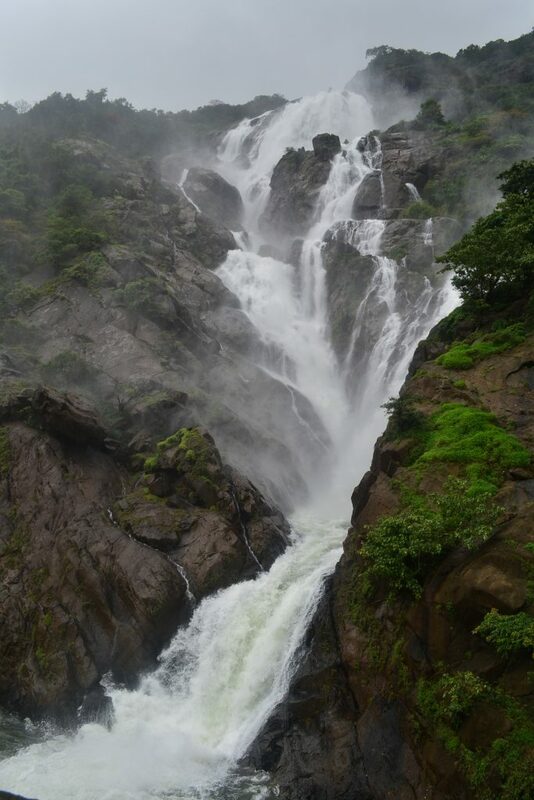 In the monsoons, bikes are also available to take you to the falls but the ride can be bone-jarring and not without risks. 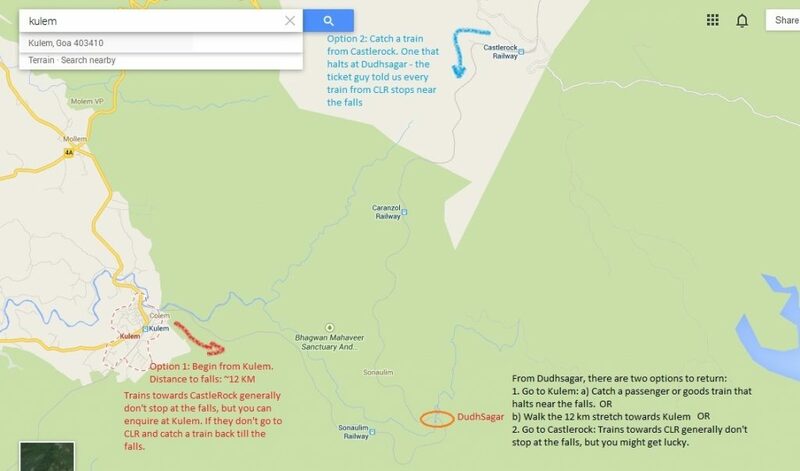 The thin grey line is the railway track – your path to Mordor … oops Dudhsagar. 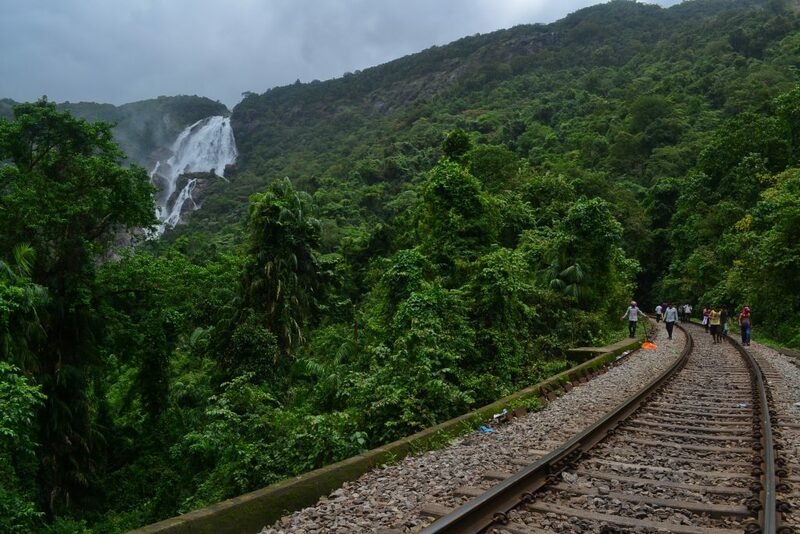 As soon as the train nears Dudhsagar, cameras and smartphones are whipped out and the excitement among the passengers is palpable. 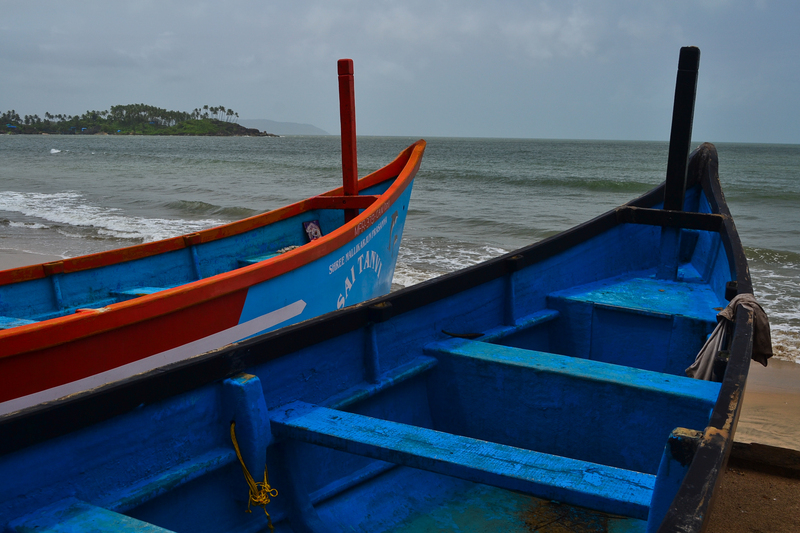 We chose to ride to Castlerock from Kulem station and catch the Amravati passenger back from Castlerock. 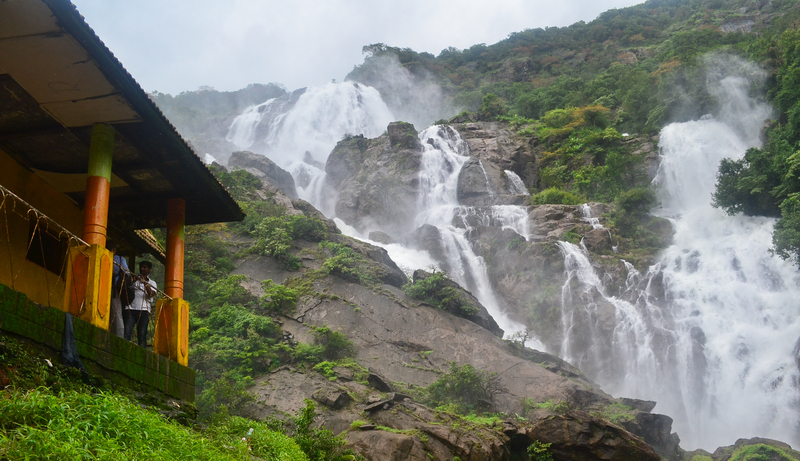 It halts at Dudhsagar station (a small decrepit station) where you can disembark and walk a few meters to the waterfall. A few more photographs follow. We waited patiently at Castlerock station for the passenger train to Dudhsagar. 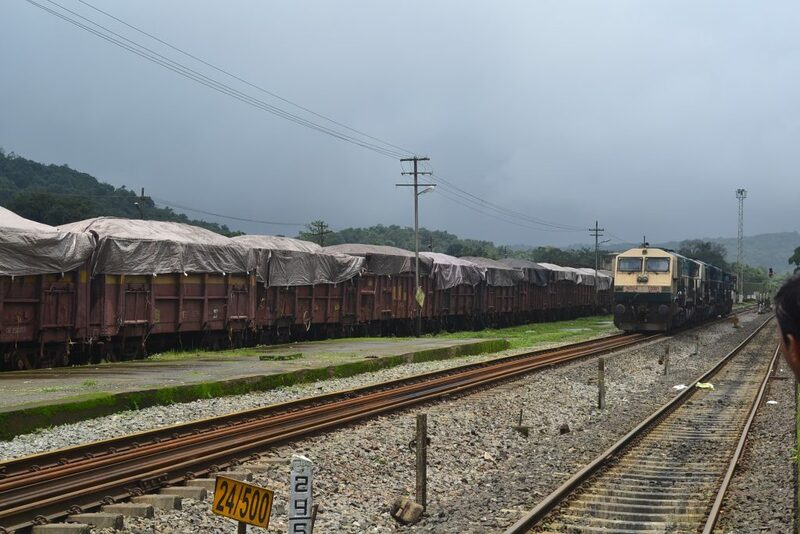 Wagons and electric locos kept us company. A small shelter doubles up as a vantage point to view the falls as well as a camping point for people who want to stay for the night. The 12 km trek to Kulem is long and arduous and can be a daunting task for a lot of people, especially if you are unprepared. However, we saw saree clad women making the trek to visit the fall. A few monkeys seem to be mandatory on such treks – their numbers will only grow once they realize food can be easy to come by.Having said that, shoes are a good option considering the Indian railways is the world’s largest open-air toilet. 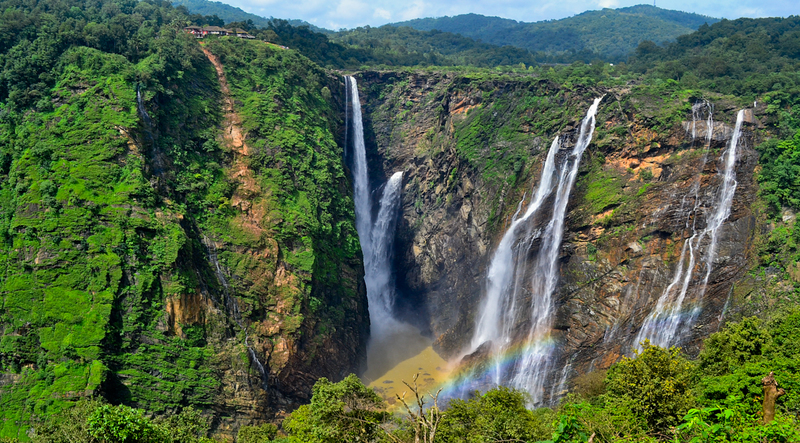 The roar of the waterfalls can be heard from a few hundred meters as well. The assistants at Sonaulim station told us this spot gained its popularity only after it was featured in a recent Bollywood movie. The crowds we saw seem to substantiate that statement. 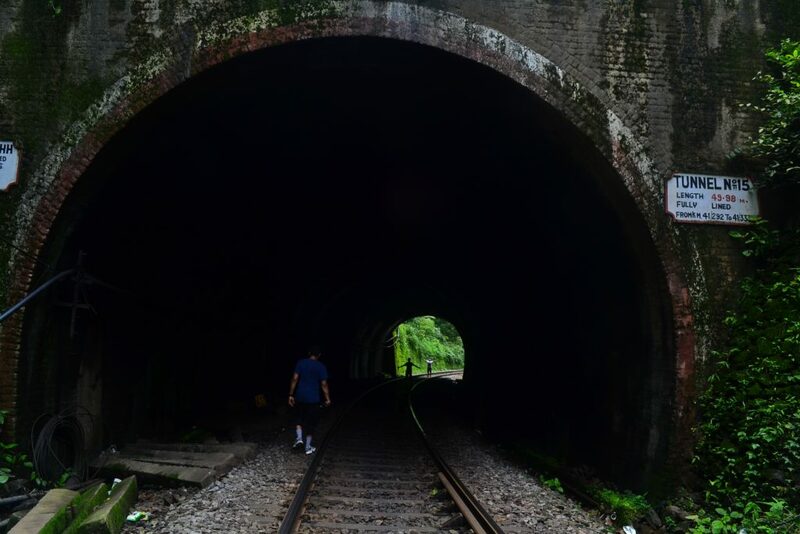 Tunnels can be treacherous – they are poorly lit and the gap between the sleepers can be un-uniform. Reason enough to carry a torch or light up your smartphone. Also beware of oncoming trains. 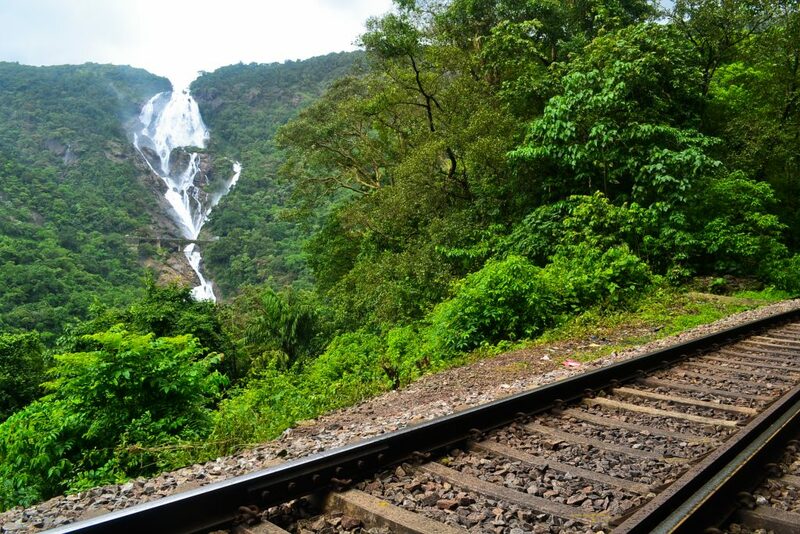 The shrill horn of the trains echoes around the ghats and it becomes difficult to ascertain which direction the train is coming from – facing a train coming from up ahead, we chose to race out of the tunnel than face the train inside the tunnel. One more look at the beautiful waterfall. We were lucky enough to flag down a passing goods train and hitch a ride in its caboose. The ride in the caboose itself is another story altogether – just remember to grab on to something tight. Wonderful series, really enjoyed the 6th shot ~ well done! Thanks ! Your words are as kind as they are encouraging, Dalo. Many thanks again..